On the next day, I was on my own again, but thanks to the day with my friend, I felt much more confident than in the beginning. I knew I would just shake off all attempts to get me in a tuk tuk and go where I wanted. 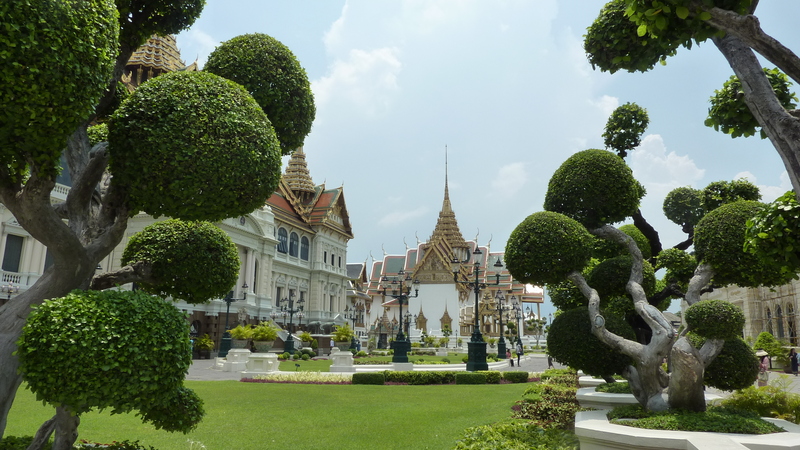 And this time, I knew where I wanted to go: The Grand Palace. It was only a short walk away from my hotel but it involved crossing a big crossing without (useful) traffic lights, which was a challenge on its own at first. Once you get used to the fact that you have to be a little bold and just go when there’s a chance it’s fine. Of course I was approached by tuk tuk drivers, who even spoke German, again but this time I didn’t listen to their talks. I just walked on to the palace. There, it was crazily full with tourists and unofficial guides who tried to sell their service. However, it became a little bit quieter inside the palace. I took my time to look at everything very closely and got lost in the story painted on the inner side of the palace walls. 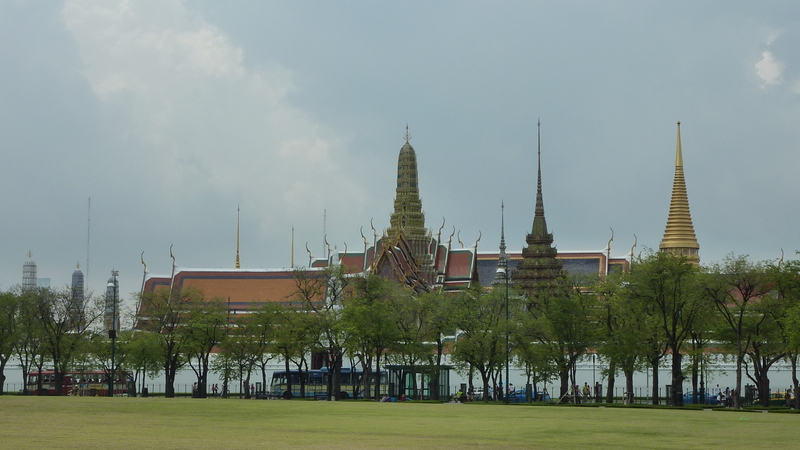 The palace grounds also include a fashion museum showing the dresses worn by Queen Sirikit and an exhibition of regalia and it took me four hours to see everything. 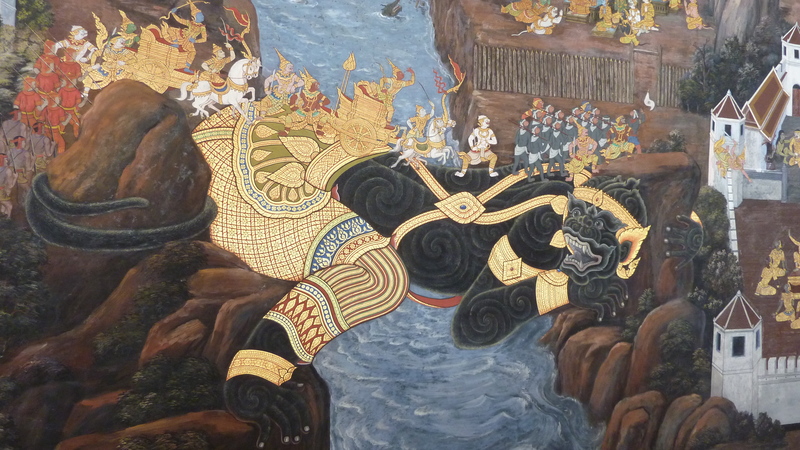 Later, I went to the Siam Museum, which was very interesting, too. Since I went there after 4 pm admission was free! But even if you had to pay for it it’s certainly worth a visit. 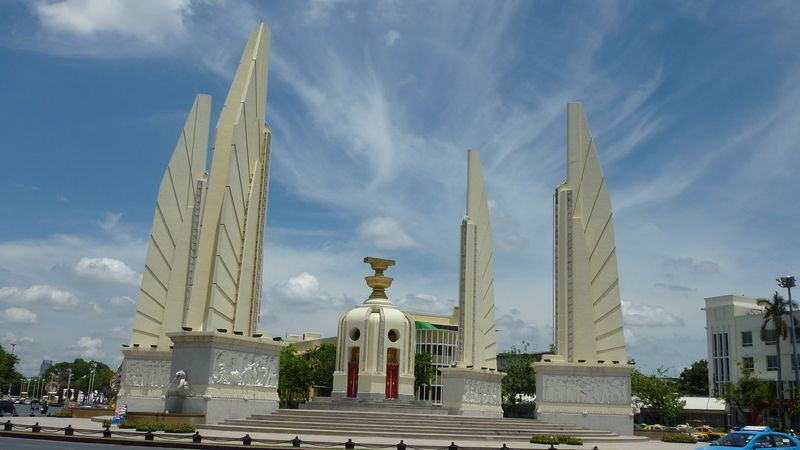 I learned much about the culture and history of Thailand. After this visit I didn’t feel that unfamiliar with everything anymore. Half a year has passed since I went to Bangkok and now I’m here again, this time for a conference. So many things happened in between and I was too busy to blog, but now I unexpectedly got some spare time and I take this as an opportunity to finally continue writing about my holiday trip to Thailand. 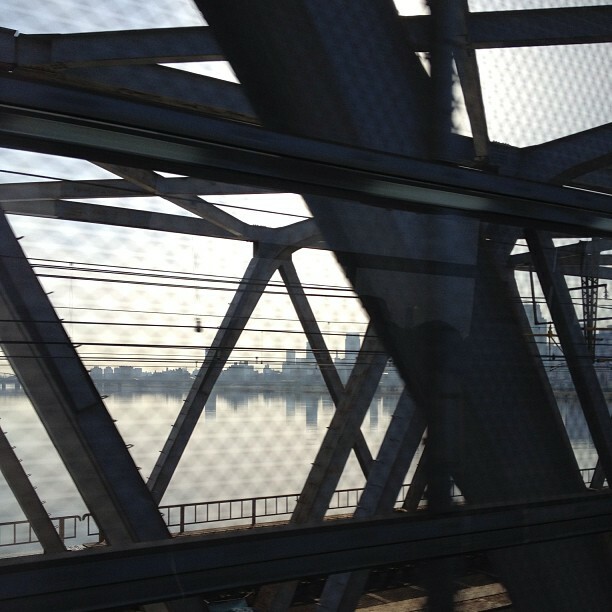 So, I think so far I only blogged about the first day and I’ll speed up a little from now on. The first day was the most exciting (and stressful) day anyways. On the second day, I was happy to meet my Thai friend who took me by the hand and showed me around. I hadn’t met her for 4,5 years, but she hadn’t changed a bit since we said goodbye in Osaka. Because I knew her from Japan, we talked in Japanese the whole time, sometimes causing confused looks in some Thai people and a Japanese man who sat next to us in a restaurant, too. First, we went to the weekend market for some shopping. 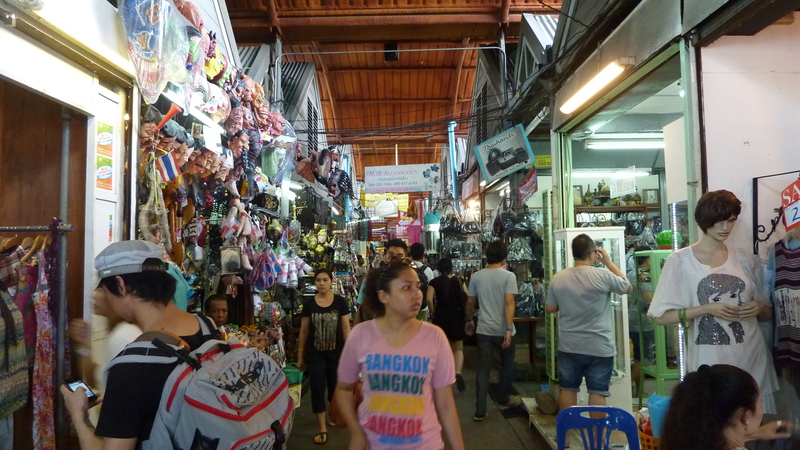 It’s a huge market selling everything from clothes, accessories, souvenirs and much more. It’s so large, I probably only saw a fraction of the stalls. But there were many interesting and beautiful things to buy and the best about it: they were also quite cheap. Sometimes in the negative sense of cheap, but if you check your goods thoroughly for holes and other mistakes before buying, you can get some really nice things there. In between shopping we had some refreshing smoothies and then went on to Jim Thompson’s House. 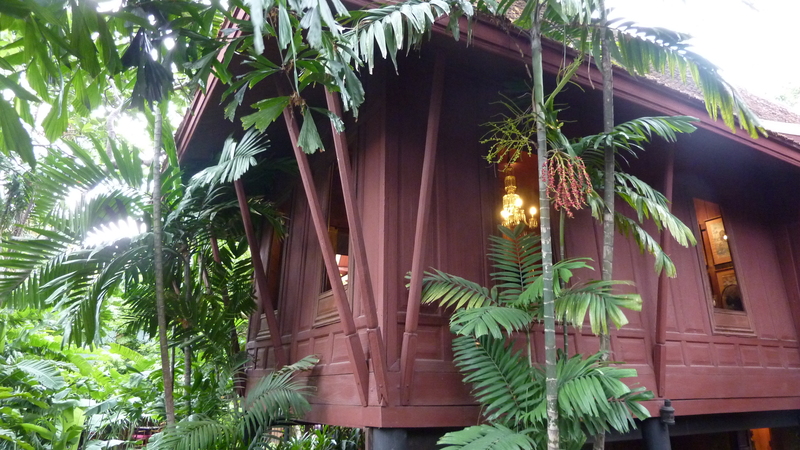 It’s a complex of wooden houses built by the American architect and silk trader Jim Thompson. In the evening, we ate sukiyaki. Despite originally being a Japanese dish, the Thai version of sukiyaki is hardly comparable to the Japanese, which consists of thin slices of beef, vegetables and tofu that are cooked in sugar and soy sauce. Instead, Thai sukiyaki was cooked in a light clear broth and included a greater variety of ingredients that were then dipped into some sauce like Japanese nabe or shabu shabu. Anyways, it was delicious 🙂 We also had emerald noodles and duck. The blue sky with its happy little clouds and the bright roof tiles made a totally different impression than the night before. But when I got into the bathroom I saw a big cockroach. It was lying on the back pretending to be dead, but when I wanted to throw it away it got up. So I had to kill it anyway… But I was kind of relieved, because a dead cockroach would have worried me more than a living… I mean, they survive everything, right? What would it mean if there was a dead cockroach in my room?! It was almost noon when I finally got to move my room and then I went out to explore the neighborhood. As soon as I stepped out of the hotel, taxi drivers where approaching me. But I didn’t want to go anywhere, I just wanted to walk and so I turned into Khaosan road. It was almost empty and very quiet at this time. 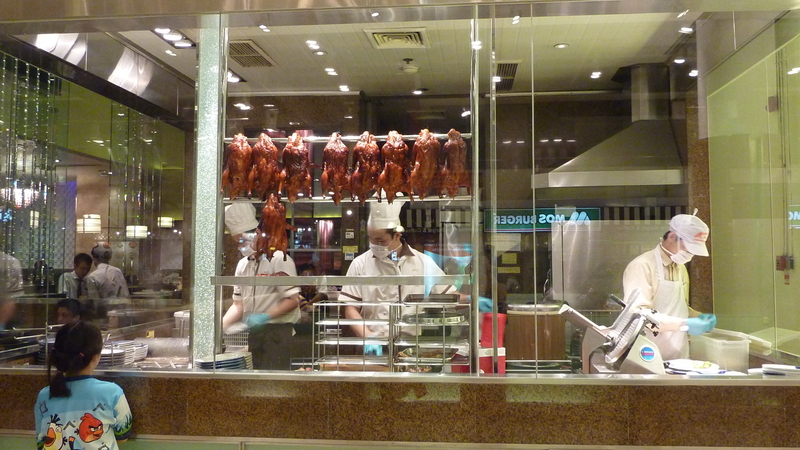 Only a few tourists were having lunch and I decided to get some food too before I would walk on. There was a temple near the monument, but there weren’t any tourists or other people. While I was looking for the entrance a man walked up to me and started talking to me in English. He said he was an English teacher at a highschool near that temple and asked me questions like where I’m from etc. It seemed like he was just interested in talking English to a foreigner. He told me that the temple was closed because of a Buddhist holiday (I started to believe that it was one) and invited me to chat for a while. After some small talk he started to tell me about some places I should go and where better not to go, including tailors. 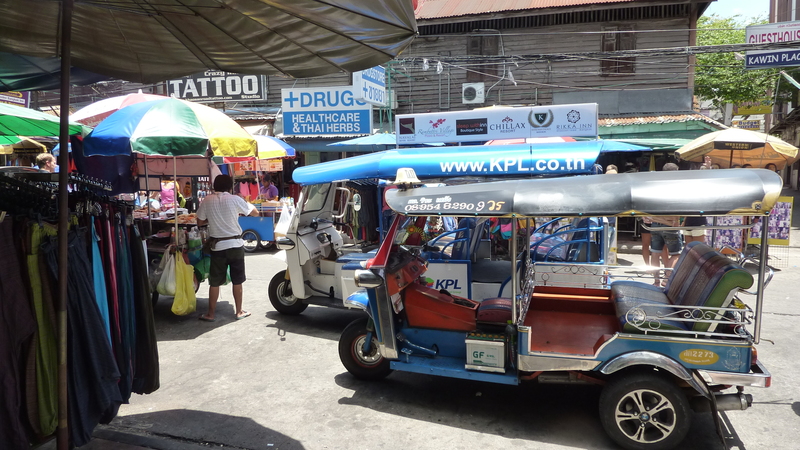 He even marked the spots in my map and seemed really helpful, but in the end he guided me… to a Tuk Tuk! Oh no, I thought, but he had been so kind that I thought I couldn’t turn down his offer… After all, could I say I’ve been to Thailand without ever riding a Tuk Tuk? And the driver would charge only 1 Euro for two hours driving so it wouldn’t be a great loss, would it? 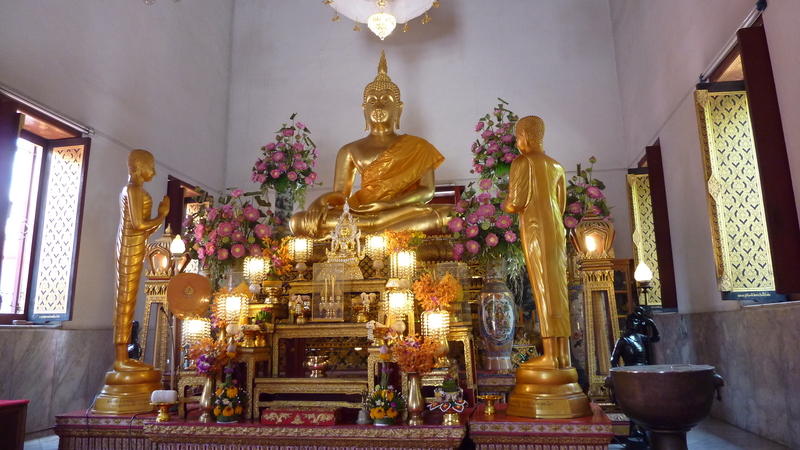 So I got on the Tuk Tuk and we went to the first stop, a small temple not far away. While the driver was waiting, I went inside. There was one monk meditating and one Thai who chatted with me. He told me that his wife was in hospital, because she was in labour and he came to the temple to pray for a safe birth. He also told me that because of the Buddhist holiday, tailors would give discounts on their clothes so that he could afford some very fine clothes that would be too expensive for him usually. He even mentioned the same tailor the English teacher had recommended. I began to feel safe. Maybe I had been really lucky to meet that English teacher, I thought. But then the drive with the Tuk Tuk turned into a tourist trap. It was exactly as I had been told: The Tuk Tuk drivers take you from shop to shop and hope that you buy something so they would get coupons for gasoline. But the Tuk Tuk driver wasn’t satisfied with the outcome. He drove me to another tailor and asked me to at least have a look so he could get his coupons. Well, I had a look but didn’t want to get into the same hassle again so I left after five minutes. 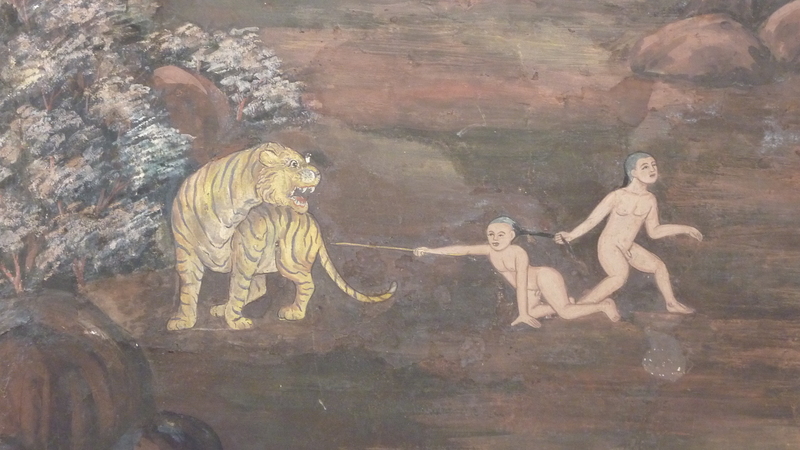 What followed were a jewel and souvenir shop and a tourist agency, where I booked a day-trip to Kanchanaburi. 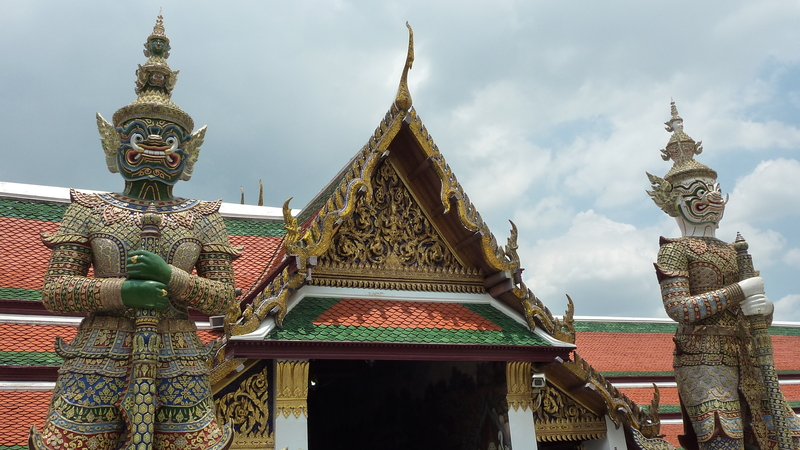 It seemed like the whole tour was good for something at last… The Tuk Tuk driver still wanted to go on afterwards and show me more clothes shops but I had more than enough. I asked him to drive me back to the Democracy monument which he did. When I paid him he had a look at the small bag I got at the souvenir shop and asked how much I had paid. It was around 5 Euro, so he got pissed and just said “cheap”. And that was pretty much the end of the tour. In the end, I had been driving around for almost four hours without any break and I was quite exhausted but I didn’t want to end my first day in Bangkok like this so I decided to continue walking for a little while. Unfortunately, I didn’t take the route I intended to and it took some time for me to notice my mistake and reorientate. 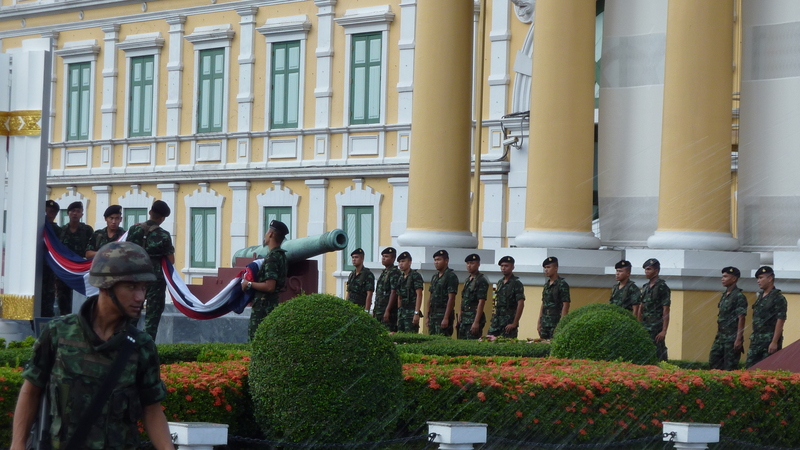 Somehow I had ended up at the Ministry of Defence where a group of soldiers was pulling down the flag. Then I just wanted to return to my hotel but it wasn’t that easy to get there even after I found my current place on the map, because there were some big roads which could only be crossed at certain points so I had to go back and forth to find a way. Somehow I made my way back, took a shower and ate at the Indian restaurant a few meters away from my hotel. How glad was I that I would meet my friend the next day! The day before my departure I was at university all day. I hadn’t packed my stuff yet and wanted to do that when I came home in the evening but first there were some last mails to write. When I was finally prepared for my trip it was 2 o’clock in the morning and I would have to get up at 5:30 to catch my bus to Kansai airport. So I didn’t get much sleep but I managed not to oversleep and was on the bus on time. Everything went smooth at the airport, except that the lady at the check-in counter must have seen a German passport for the first time in her life… She looked at my passport like forever as if she thought it was fake. After a while she tried to read “Deu… Deuch…?” “Doitsu desu ne” (“It’s Germany”) I replied. It was my first flight with China Airlines and just the day before I had talked with a friend who fights his fear of flying by using a service which informs him about problems on all flights so he could find out which companies often report problems and which don’t. He didn’t name China Airlines as one of those who don’t report problems that much… Luckily, I have no fear of flying. On the contrary, I usually enjoy it very much. My first impression of the plane was that it looks a bit old and not as clean as I was used to. There was a bubble gum sticked to the seat in front of me… But this also speaks for the passenger flying before me and since its colour blended in perfectly with the plastic of the seat I thought that this is forgivable. Otherwise, I couldn’t complain about the service. The food was alright and the entertainment system up to date. I had to transfer in Taipei where I landed on time and continued my journey just a little later. When we finally had to turn to Bangkok the plane finally got into some great turbulences. It felt like a rollercoaster ride and some people started to scream… At that time, I was listening to Leona Lewis’ “Trouble”. Oh, the irony. Finally we landed safely, I got through the immigration procedure and got my luggage. The hotel had written on its homepage that it would be the easiest to go to the hotel by taxi and I decided to stick to that advice. I had printed the map the hotel provided as well but the taxi-driver didn’t seem happy with it. After a while he asked me if he could bring me to Khaosan road instead of the hotel because he wasn’t sure if the road of the hotel was broad enough for cars. The taxi ride including highway fees and a surcharge, which the driver apparently was allowed to add, summed up to around 550 Baht (ca. 14 Euro) in the end. The driver told me where Khaosan road was and then I put my feet on Bangkok’s ground for the first time. After some back and forth I returned to my starting point. I was thinking whether I should just walk through Khaosan road but it still seemed very bothersome and I decided to try the parallel road one more time. This time I walked past the crossing and finally, I somehow ended up near the end of Khaosan road. At least I knew that the hotel wasn’t far from there so I felt relieved. Finally, finally, I reached my hotel. At the reception I was told that there were no more single rooms so I was given a double room for that night. I had to change rooms on the next day and couldn’t leave the hotel until then but that was fine with me. I intended to sleep longer the next morning anyways. The hotel did have an elevator for luggage and if you didn’t fit in your bag you had to walk the stairs. Just kidding, you had to walk anyways 😉 My room was on the 5th floor, yay! The room itself was just as I had expected and as it looked at the pictures I had seen. It was clean but the bathroom smelled a little bit like sewage. It wasn’t much though, so it was bearable. My last mission that day was to get some food and water from the 7-Eleven across the street. 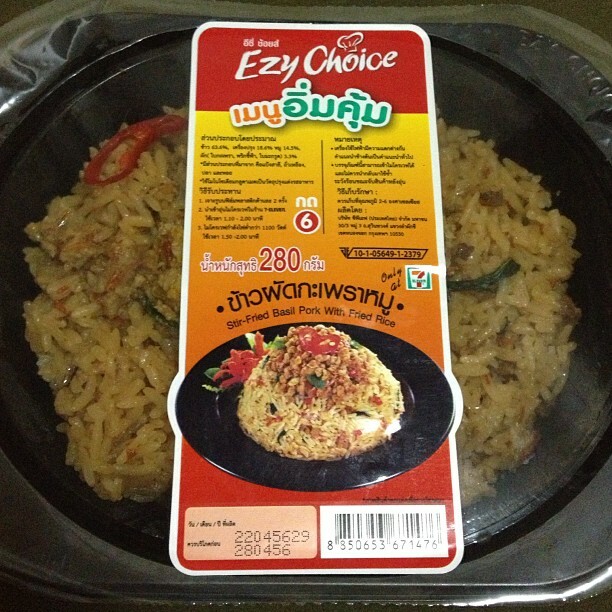 I managed to pick the spiciest meal available as my friends told me later: Some fried rice with pork and basil. Ever since my first stay in Japan I kept saying that I also wanted to travel other Asian countries more but due to a lack of time and money nothing of that sort happened during the six and a half years that have passed since then. Then in the middle of March this year I finally decided to travel. After all, I had been working and researching almost non-stop since January and needed a break. And thanks to all the work I even had enough money to actually go on a trip. I also thought that I need to visit an unknown place to break out of my usual thinking patterns. Japan had become familiar, I had become somewhat Japanese and I wanted to get to know other countries before I became a victim of the “safe Japan dangerous overseas” belief. I contacted one of my Thai friends to ask for advice on hotels and started searching for flights. I could manage to go a few days before Golden Week, one of Japan’s busiest travel seasons, so I got a very cheap flight with China Airlines. From my friend I had heard that the area around Khaosan was a safe place to stay and looked for hotels in that area. 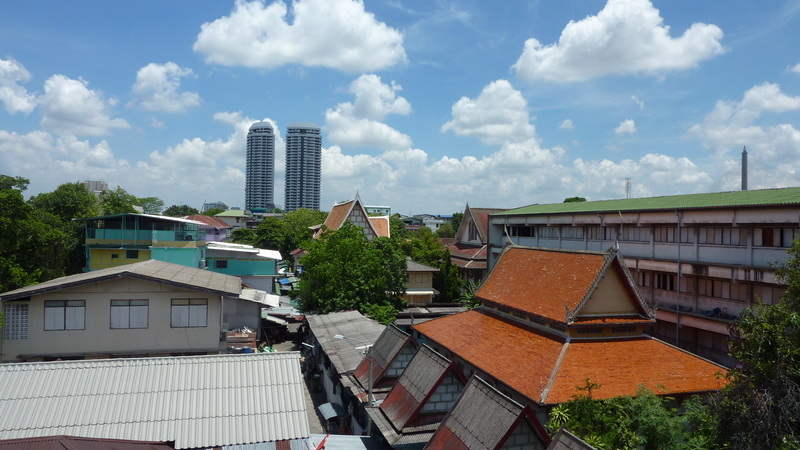 Khaosan is Bangkok’s backpacker’s ghetto, a very fitting name as I should learn later, but I am not a backpacker and didn’t want to stay in a dormitory which would be the cheapest option. However, after scanning several travel websites I found a hotel which offered single rooms with private bathrooms at a dormitory’s price. Opinions on the quality varied greatly but you get what you pay for and I didn’t expect anything more than a clean, lockable room and my own bath. No amenities, no service. The fact that the hotel offered air condition seemed like an exorbitant service already! What more could I wish for? 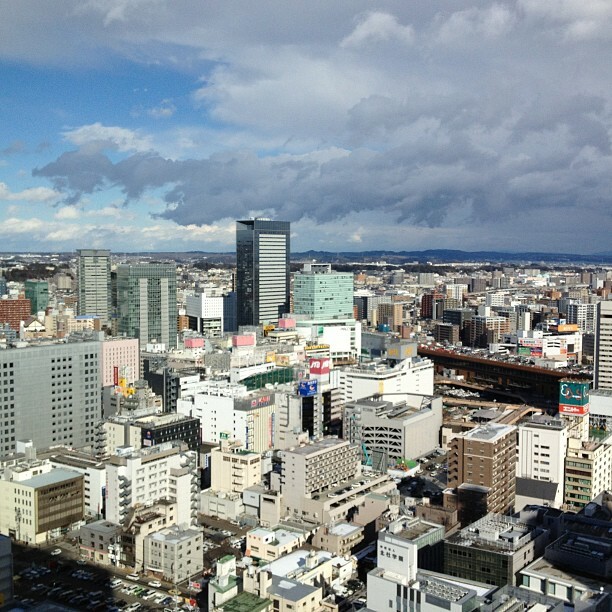 At the end of January, I had the opportunity to visit the Tohoku region of Japan, because I went to the conference of the Japan Society of Health Evaluation and Promotion which took place in Sendai. The conference wasn’t very interesting, but it was a nice short trip to a region of Japan I hadn’t been to and I used it to the fullest. It has already been a strange feeling landing at Sendai airport which had been flooded but didn’t show a trace of that. 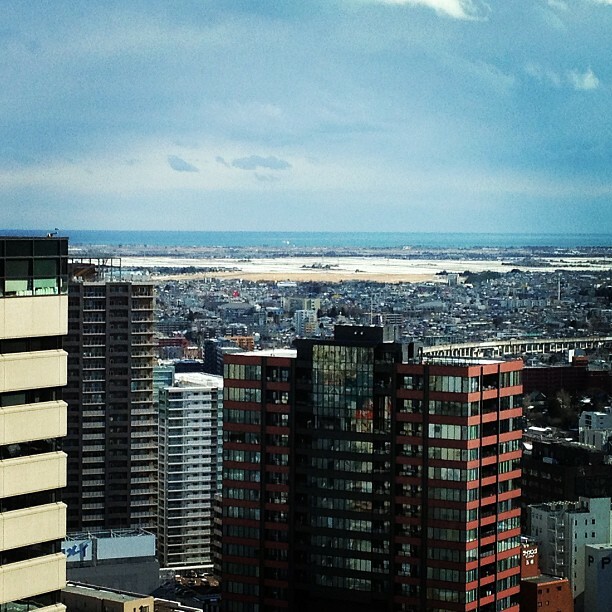 But looking over Sendai from Westin Hotel showed a different picture. 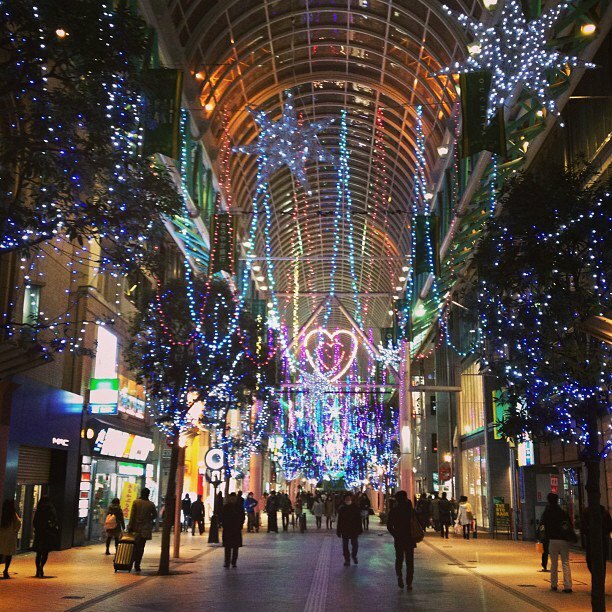 Living in Osaka, which rarely sees any snow, I am used to people not wearing winter clothes, but in Tohoku I expected the people to adapt a bit more to the cold climate. Obviously, this wasn’t he case. 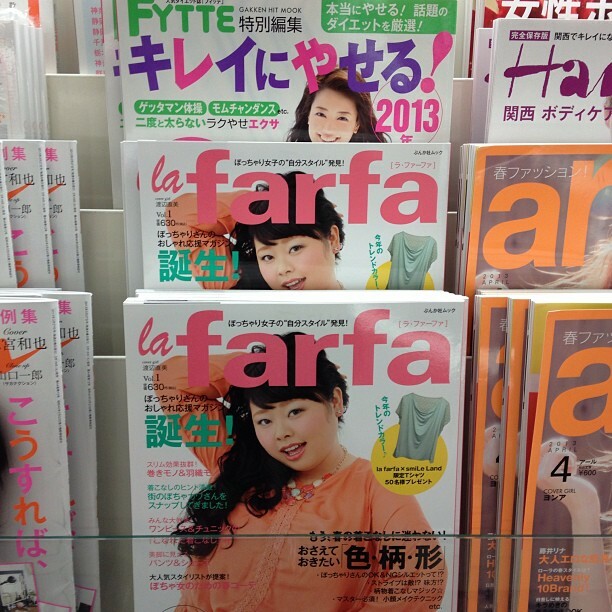 It seems like the Japanese pride in their four seasons doesn’t lead to distinct clothes fit to each. Also cleaning your car before you drive wasn’t very common and so the sight of people driving with snow on top and undetectable lights was the norm. Even the buses were no exception. 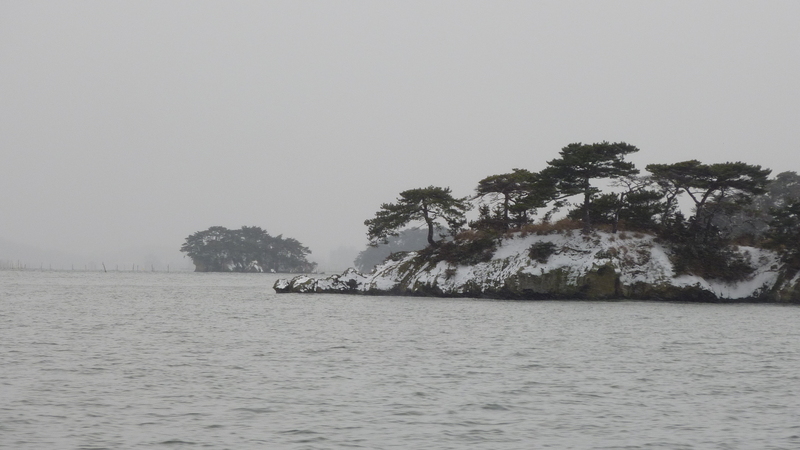 Anyways, it was snowing in Matsushima, too, but I enjoyed the tour around the islands nevertheless. It truly is a beautiful place. In fact, it is so beautiful the haiku poet Matsuo Bashou dedicated more words in his famous “Oku no hosomichi” (The Narrow Road to the Deep North) to Matsushima than to any other place. 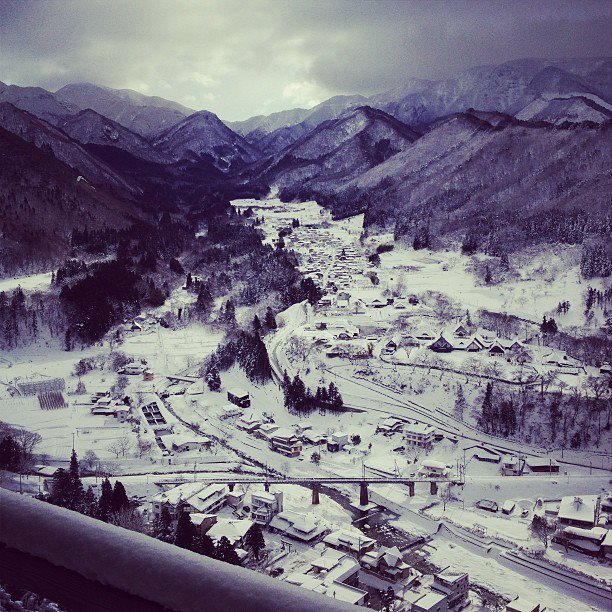 On the last day, I went to Yamadera in Yamagata prefecture on my own. It takes almost an hour by train to get there and the more the train got into the mountains the more snow there was. 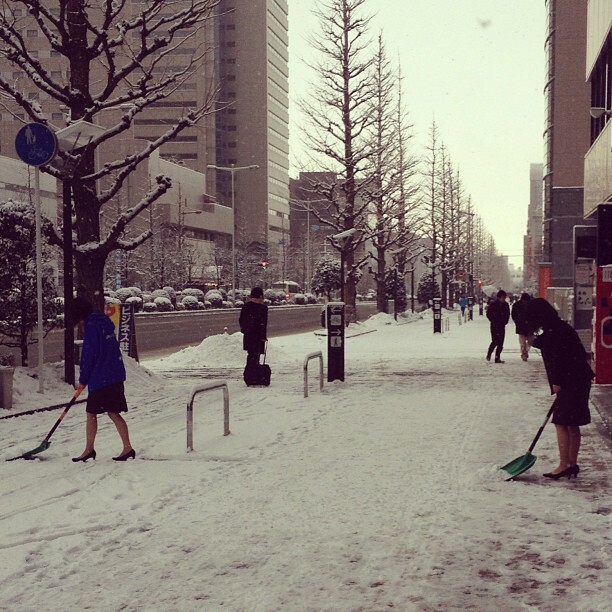 Even in Sendai the snow had accumulated to around 10 cm but at Yamadera it must have been at least 40 cm. I was very lucky that the snow had already stopped falling but was still fresh enough to lay on the trees. Yamadera is a temple built on top of a hill so you have to climb many stairs to get there. It isn’t a very long or difficult way though. 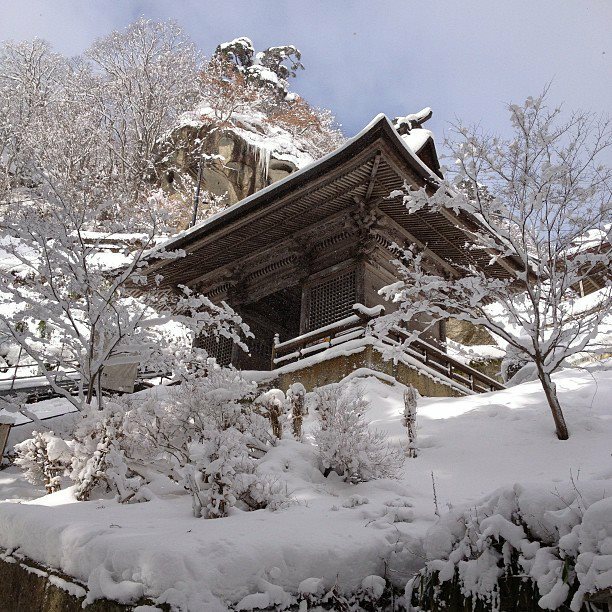 Under normal conditions that is… It was said on the temple’s website that it could be visited anytime, even in winter, because the path would be cleaned. Well, the snow was piled up on one side of the path but there was still enough snow to make it super slippery. 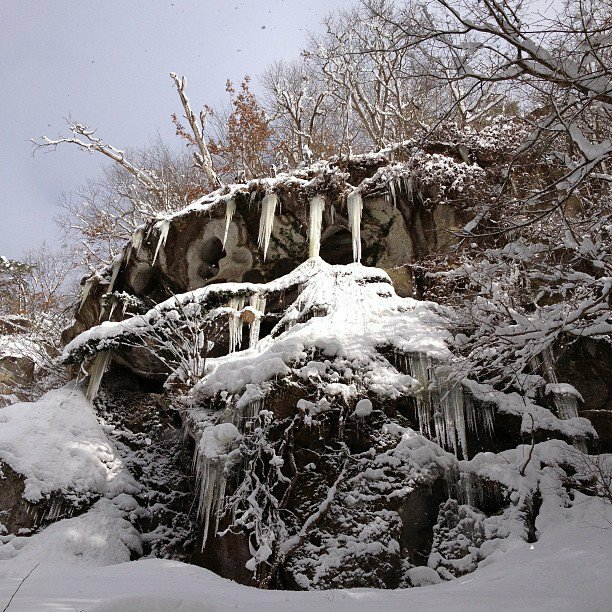 So I struggled with every step, especially when the snow was piled up on the side that would have provided a handrail… I should have listened to the woman where I paid the entrance fee of 300 Yen and borrow boots for the hike. But the first stairs were easy to walk and so I thought I could go on in my own boots. What a big mistake!